A. Y. Jackson, a prominent member of the famous 'Group of Seven', lived and painted in Manotick from 1957 to 1962. His art was inspired by the landscapes and wildlife of Canada, and is featured in the National Gallery of Canada. 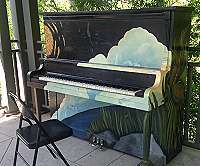 The Manotick Art Association championed the naming of A. Y. Jackson Park in the artist's honour. The riverside setting on "Manotick island" provides a place where many people go to paint, draw or photograph the picturesque Watson's Mill on the opposite bank. People often fish from the park's shore as well as from the Dam. The park includes perennials, wildflowers, trees planted by members of the Manotick Horticulture Society. A gazebo overlooks the river and mill and benches provide a place to rest. A stairway leads to the water's edge. A number of very large stones have been specially selected and brought to the site to form a memorial garden where visitors can read about the life and times of the famous Canadian painter. The park promotes local history and nature interpretation. 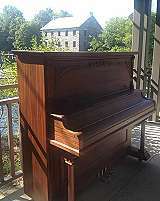 In August 2016, a piano donated by the Riggs family to Pianos in the Park was placed in the gazebo for all to enjoy that year. 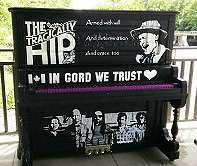 In 2017, the required money was raised by volunteers and businesses to place the "Gord Downey" tribute piano in the gazebo at the end of July. Ongoing fundraising would require about $700 each year for moving, storage and tuning. A. Y. Jackson Park sod turning ceremony was held November 6, 2002 by the Manotick A. Y. Jackson Park Committee and Mayor Chiarelli of the City of Ottawa. The park was completed in 2004. For more information about the park contact the Manotick Village & Community Association or Charlie Spratt (charles.spratt@sympatico).